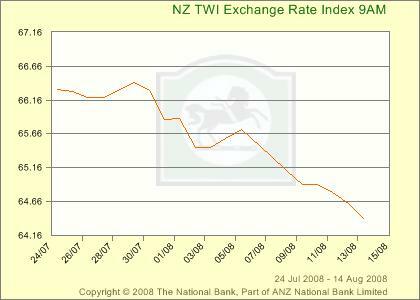 Damn, I wish I had picked up this graph yesterday – as the 24 July was when the RBNZ cut the OCR, which made the TWI fall by about 100 basis points. Why the hell is this happening? Now, the dollars decline hasn’t been the result of further bad economic news. House sales and employment were well above expectations while house prices and the labour cost index where only marginally lower. Consumer confidence improved, while business confidence slid (in the face of rising inflation expectations). Furthermore, higher inflation expectations and a recovery in employment reduce the number of rate cuts that can be expected in the short-term – a fact that should have driven our currency up, but didn’t. As a result, the decline does not appear to be the result of domestic economic factors. Yes, indeed they are. The appreciation of the US dollar over the last month explains a lot of the fall back in our currency. However, we have also fallen against the Yen, Euro, and Pound. As a result, the “improved outlook” in the US does not tell us the whole story. Furthermore, it is important to note that our dollar has appreciated against the Aussie dollar – which is sinking like a stone. It appears that the Japanese, European, and British economies are slowing a lot more quickly than people anticipated. Although this would normally imply that our dollar would strengthen against them, it is important to remember that we borrow a large amount of money from these specific nations. As a result, when their economy slows they might take this as a sign to change the risk profile of their investments – leading to lower demand for “risky” New Zealand bonds – this in itself would explain a fall in our currency. Add to this the recent decline in commodity prices on the back of “falling” demand from China, US, Japan, and Europe (in that order of importance). Movements in the TWI are a fairly good measure of movements in the terms of trade for commodity based countries like Australia and New Zealand – as a result, the market may be reacting to a sharp decline in our commodity prices. Finally, it may be the case that, since we are so close to Australia, people trade our dollar in the same way. With the Aussies facing a fall in commodity prices and lower interest rates, our dollar might just be coming for a ride. We’re dropping heavily against the Canadian dollar as well: February-April we bounced around the $0.80 mark; we’re now down to $0.74. It’s not just US dollar strength. Canada is a pretty small chunk of our TWI though – however, that is very interesting for the fact that Canada is a commodity currency as well. Ultimately, the fact that Australia and New Zealand dollars are more closely aligned to currency prices, and the fact that the linkage between a “potentially stronger” US economy and Canada is greater than our linkage with the US may be sufficient to explain this difference.